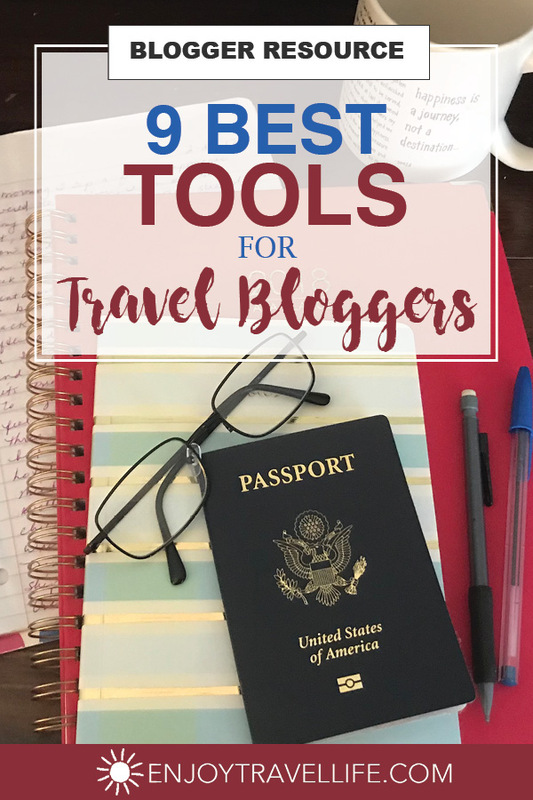 Many of you ask which are the best blogging tools I use to manage the Enjoy Travel Life website. Blogging is no different from any profession; with the right tools, the job gets a lot easier. With so many choices, how’s a blogger to know in which ones to invest? And even if they are free, there’s time involved in learning and using a tool-set. If I only had this list of the best blogging tools when began Enjoy Travel Life. I tried quite a few different tools and ditched as many. Yes, I certainly wasted time and money and had unnecessary overlap in the beginning. But once I finally got my head around what was essential, I trimmed the fat. As a result, I love a lean but useful few darlings. Here they are: what I consider the best blogging tools at the core of Enjoy Travel Life. Honestly, a couple of them (like MiloTree) are worth their weight in gold. Yay for things that make my life easier! Yay again if they make yours easier, too! Click the graphic below to find out more, or scroll down to find out how I use these blogging tools and what I love about each. I use Bluehost as my web hosting platform. To be honest, I didn’t look too far into other platforms, since Bluehost came so highly recommended, I went with it and have been happy. I’ve read that some bloggers have switched after reaching a certain traffic level, but for me, so far, so good! Who knew I was making so many grammatical mistakes? I am a seasoned writer, and Grammarly still picks up errors. Yikes! All I can say is, I love a tool that makes me look good. I use it when I’m writing blog posts, and when I’m writing emails or posting on social media. I’m not sure how I survived without it. Grammarly makes me look good! G Suite is a must-have in my mind. I use Google Docs to create/edit documents and spreadsheets and to store PDFs for content upgrades, as well as Google Calendar. My Gmail linked to Google Analytics, AdSense, and PayPal. I’m barely scratching the surface functionality (but that’s where I am! Robust functionality and flexibility, all Free! I haven’t heard many bloggers talk about MiloTree, but I love it. It helps me increase followers and subscribers but showing an unobtrusive pop-up in the lower left corner of my website. (Don’t you hate those pesky pop-ups that make it impossible to read the page? They drive me crazy!) Love. This. Tool. Honestly, if I had to pick one on the top of my best blogging tools list, this one gets my vote. Pinterest, Instagram, Google+, Email List Growth in one tool. Yes! When folks opt-in to your email list, ConvertKit gives me a great place to capture their emails and to automatically send a welcome email series. It also allows me to issue weekly updates and free content to readers who want more. I’ve only begun to scratch the surface of ConvertKit’s usefulness, but I know it will be a cornerstone of my website. It shows me statistics about how effective my email campaigns are. Tailwind is like having a group of admins helping you get your pins out! It allows me to quickly schedule posts to my Pinterest boards, group boards, and tailwind tribes. Talk about powerful! There is no way I could have built the audience I have on Pinterest so quickly without this tool, which allows you to propagate a pin like a wildfire. With new Instagram changes, it also allows me to schedule my Instagram posts, which is so helpful. I could never keep up with posting to Instagram three times a day without Tailwind. Crowdfire has helped me quickly grow my Twitter audience by reminding me daily to post curated articles and photos, and to follow and unfollow (those irritating unfollows…gah!) targeted accounts. It also reminds me to share my posts on Twitter. Otherwise, it would take me much longer and without as good results. I used Zen-Promo to manage the gap between who I follow on Instagram and who follows back. This tool is an easy way to unfollow systematically and offers features like auto-follow and auto-responders. In summary, I suggest you do some research for yourself to arrive at a short list of best blogging tools that meet your specific needs. But I hope these nine favorites of mine help give you a bit of a jump-start!